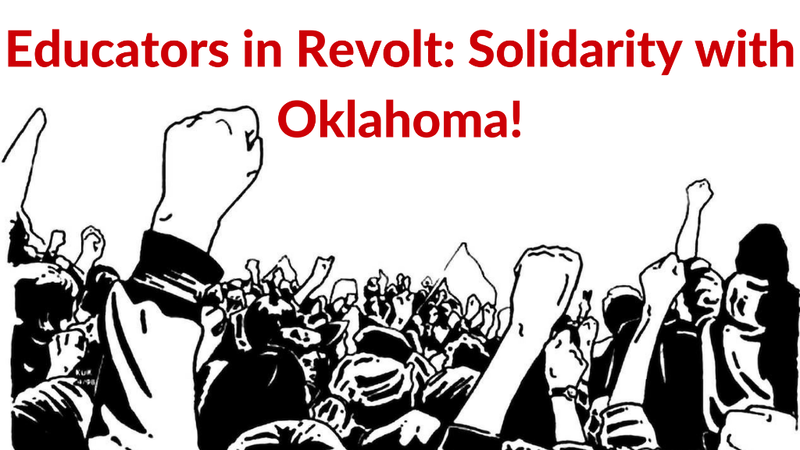 “Educators in Revolt: Solidarity with Oklahoma,” is a forum taking place in Seattle at the King Country Labor Temple on Saturday March 31st. This forum will feature educators from West Virginia, Arizona, Oklahoma, and Seattle who have been leading strikes and mass protests to defend teachers and public education. The forum will be livestreamed on the Social Equity Educators Facebook page for anyone who cannot make it in person. #EducatorsInRevolt. Saturday, March 31, 4-6 p.m. The recent strike by 20,000 West Virginia educators inspired and electrified educators and workers all over the country. Now on April 2, some 150,000 educators and public workers in Oklahoma are planning to strike. After suffering 11 years without a pay raise, Oklahoma teachers are among the lowest-paid educators in the United States. Along with their union, the Oklahoma Education Association, they are demanding $800 million in school funding and pay increases from the state legislature by that date or they will strike. In addition, the Oklahoma Public Employees Association announced its members would strike at that time if the legislature fails to approve a $213 million increase in pay for its members. When the members of the Seattle Education Association struck in 2015, we experienced the beauty of solidarity and support from people all over the country. Now it’s our turn to return the favor. Join us for a solidarity panel to support educators and public workers in Oklahoma and around the country. Please end solidarity by signing this petition.